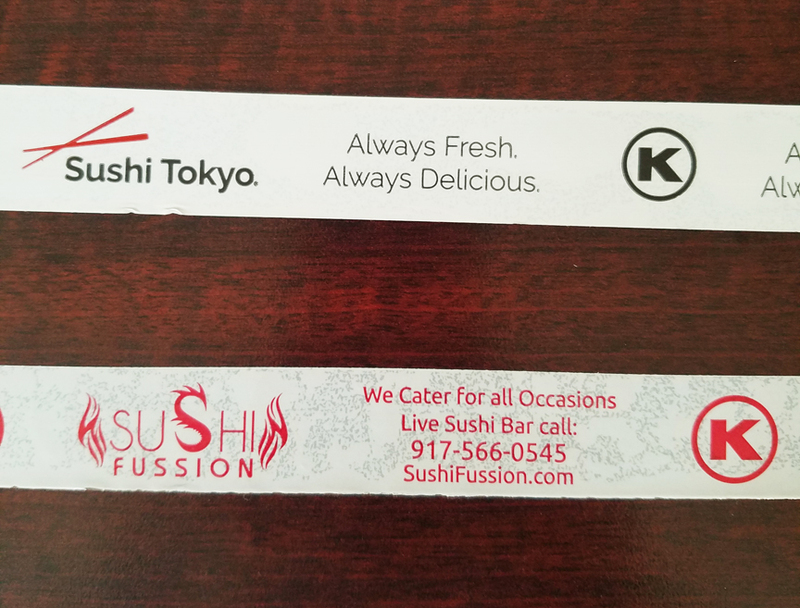 The more opaque tape on the top (Sushi Tokyo) is PVC while the less opaque tape on the bottom (Sushi Fussion) is polypropylene. 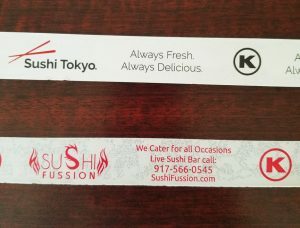 The most common question we get here at Kosher Tape Plus is what the difference between polypropylene and PVC tape is. Usually this is followed up with, “but which one is right for my business?” We hope to shed some light on the characteristics of these two tapes and help you determine which one is right for you. Our best-selling tape is the cost-efficient, high performance polypropylene. This tape is great for sealing packaging for transit and other short-term purposes. It is extremely popular in the food industry because it sticks easily to surfaces such as clamshell containers, cardboard boxes, paper and plastic bags, plastic deli containers and light bundling, making it ideal for restaurants. Polypropylene tape is best suited for items that are being transported or stored in a dry, room temperature area and are gently handled. Logos look great printed on this tape. We offer a wide range of ink colors for your tape including black, reflex blue, process blue, orange, burgundy, red and green. We also offer Pantone color matching! The popular PVC tape is made from a synthetic plastic polymer with a high quality adhesion. PVC is stronger and has a higher degree of conformability than polypropylene tape, making it suitable for sealing more heavy-duty materials. PVC tape is also much quieter when torn off the roll, making it easily distinguishable from polypropylene. For items that need to be sealed for longer periods of time, oddly shaped packaging or packaging that may come into contact with moisture, PVC is the best choice. Not only does it hold better than polypropylene, it is also water resistant and can withstand more environmental stress. Like polypropylene, this tape also prints very nicely and logos look great on it. We offer a range of ink colors not only for your logo and information, but for the tape itself as well. If you still need help deciding which tape to go with, we’d be happy to talk more with you! Give us a call at 410.585.1513 or email us at info@koshertape.com.